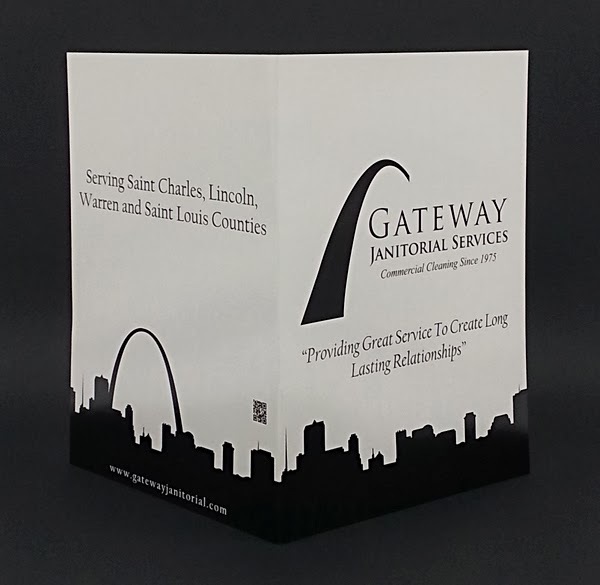 Our friends over at Gateway Janitorial Services out of Wentzville, Missouri created this one color presentation folder that packs a punch. You see, most people view a one color design as either a solid color flooded across the folder or as a simple logo placed in the center of a predominantly white folder, but Gateway Janitorial took it one step further by a creating this memorable and iconic landscape depicting there great city. By creating this one color design the client reduced cost yet still captured the essence of their business. They did this by creating a folder with black ink depicting a night-scape. When you think about the service that Gateway Janitorial Services provides it happens primarily during a companies off hours which in most cases is at night. What could you do to capture the eyes of your potential clients by using one color? 1. PMS - Use a solid flood of a single PMS color then knock out your design elements, logo and text to white. 2. Foil Stamping - Simple and elegant, foil stamping gives your presentation folder that regal look. 3. Embossing - You can emboss your logo and text directly onto your presentation folder giving your folder a 3 dimensional look and a tactile feel. 4. Die cutting - Through the use of die-cutting you can create custom pockets or something as simple as die-cutting your logo or graphic element out of the cover of the folder itself. Remember when designing your next presentation folder, with preparation and thought, you can create A One Color Presentation Folder that Packs a Punch. To get a free quote on printing your next presentation folder click here.